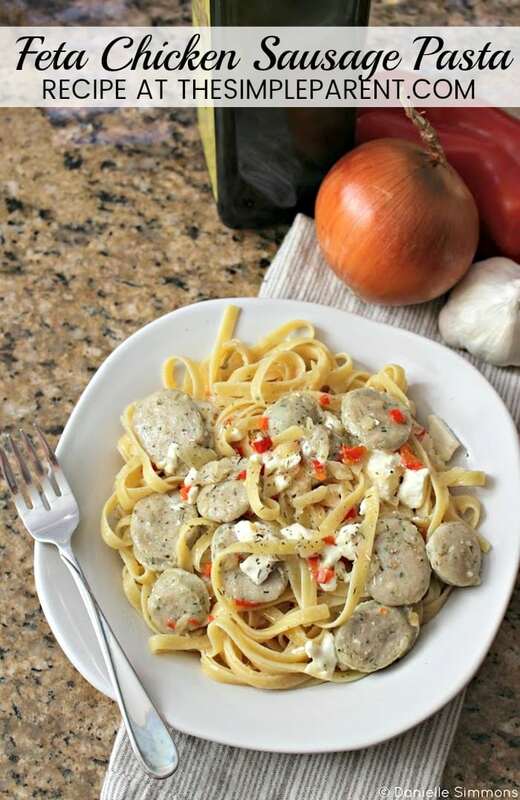 Our Creamy Feta Chicken Sausage Pasta recipe is sponsored by al fresco. 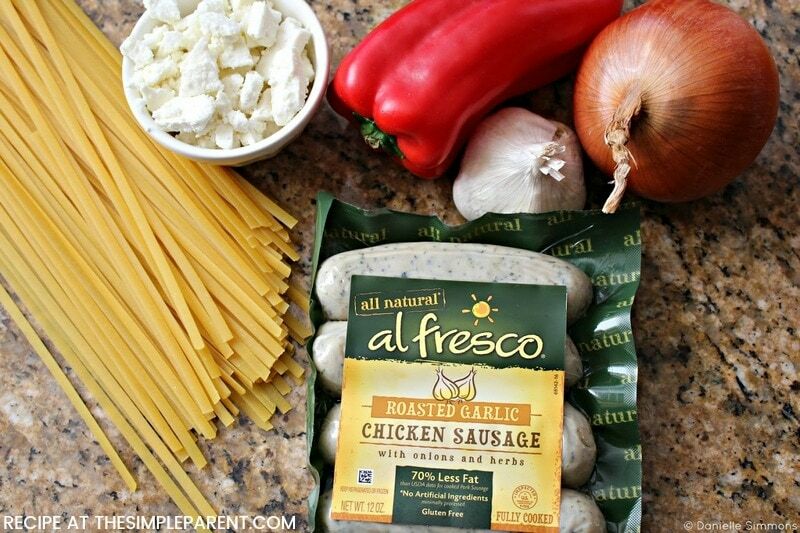 Check out how al fresco Roasted Garlic Chicken Sausage packs flavor into this family-friendly pasta dish! What is your go-to meal when you have unexpected company arriving at dinner? For our family, it’s all about pasta. It’s just so easy to make and there are so many different directions you can take it! It never gets old because it’s so easy to change up! 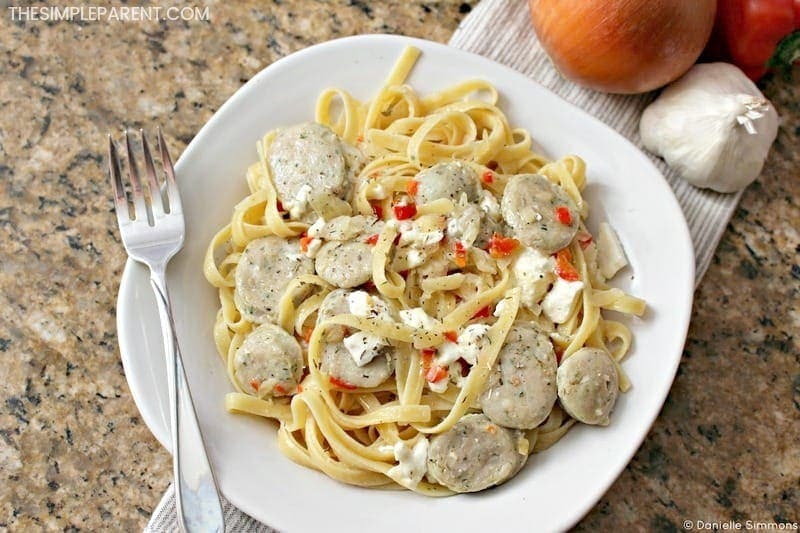 This delicious Creamy Feta Chicken Sausage Pasta dish is a perfect example! Not only is it inexpensive, we usually have all of the ingredients right in the fridge and pantry! Plus, as an added bonus it comes together in only 30 minutes. That includes the boil time for the pasta! 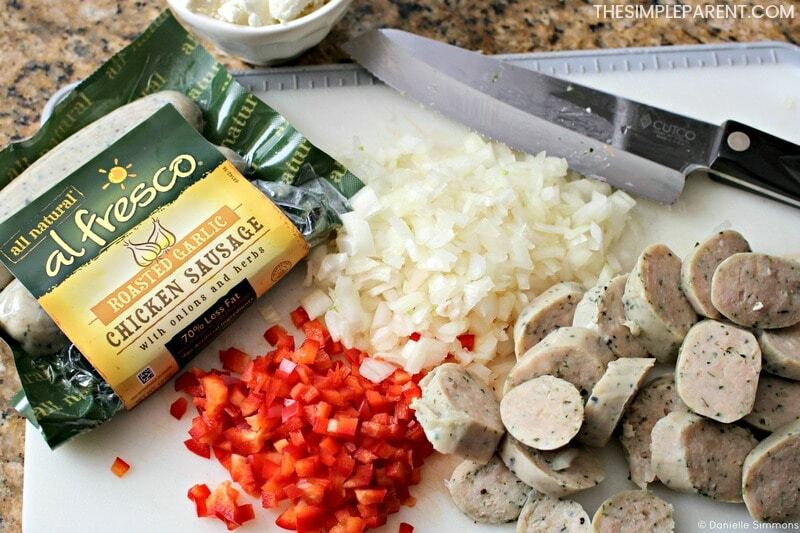 The star of the show in this recipe has to be the al fresco Roasted Garlic Chicken Sausage. It’s so rich and flavorful! It just adds an extra something that we love! And when paired with a delicious salad and crusty bread, it really hits the spot. The best part about this recipe is that there’s no wait time. There’s always something to do while something else is cooking. That’s why it comes together so quickly. Plus, if I’m thinking ahead, I can prep the veggies ahead of time and can shave off another 3-5 minutes of chop time! Boil 3 cups of water. Add 2 teaspoons of salt to the water. Once boiling, add linguine and cook according to package directions or until al dente. While water is boiling and pasta is cooking, heat a large cooking pan and add 3 tablespoons of olive oil. Once olive oil is hot, add bell pepper, onion, and garlic. Cook until onions are translucent, about 5 minutes. Add sliced al fresco Roasted Garlic Chicken Sausage and saute until slightly brown. Drain pasta, reserving 1 cup of pasta water. 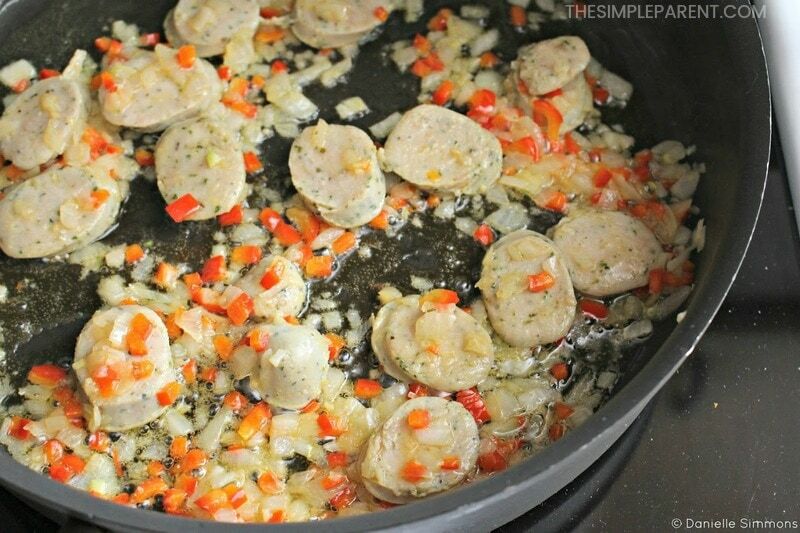 Add pasta to pan with sausage and veggies. 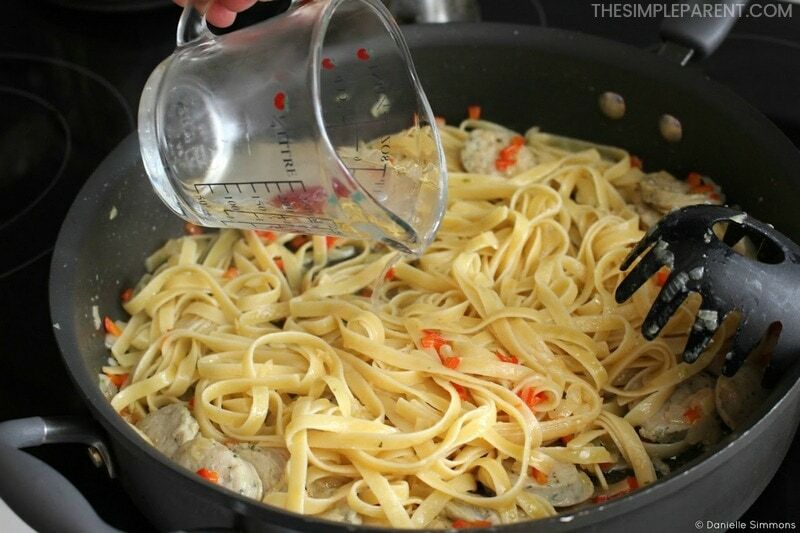 Stir to coat pasta. Add pasta water 1/4 cup at a time and let cook to create a “sauce” for the pasta scraping the bottom of the pan to get all of the good flavors incorporated. Sprinkle feta over the pasta and toss to mix. Serve and enjoy! Another thing I love about this pasta dish is that there really isn’t a sauce, so to speak. The flavors of the dish are brought together to create a sauce of sorts right in the pan! 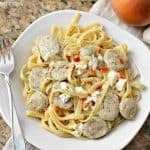 Along with the olive oil and all of the flavors it gets from the onions, bell peppers, garlic, and sausage, we use the starchy pasta water to thicken everything up and coat the pasta in its own little sauce. So the dish is a lighter pasta dish that’s perfect year round! 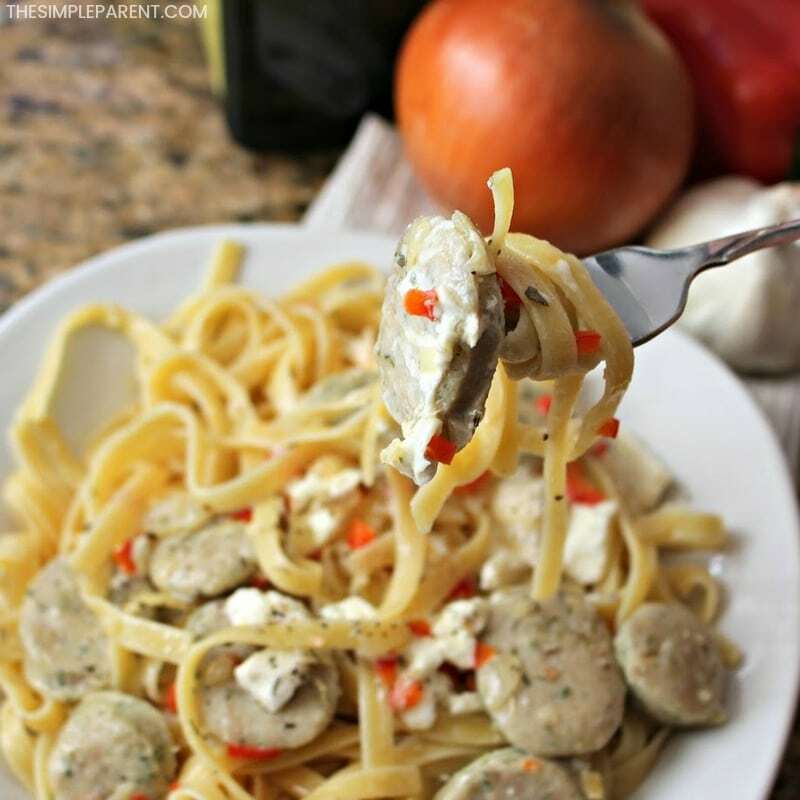 You can also use a variety of the al fresco dinner sausage flavors to change it up without having to create an entirely new recipe! You can check out even more of our easy recipes too!